One of five top-award winners of ACEEE’s States Stepping Forward awards project, the Hawaii Lead by Example Program (LBE) impressed ACEEE and an expert panel of judges with thorough program offerings and solid results. Learn more about this program and many more in the full report. 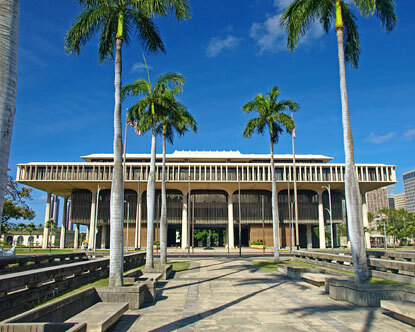 The state of Hawaii promotes energy efficiency in the public sector through its Lead by Example Program to demonstrate how investments in energy efficiency save taxpayer money and help transition the state toward a clean energy economy. The program consists of energy-saving goals and mandates; a support structure that offers trainings, information, and technical assistance to agencies as they work to meet the goals and mandates; and a data collection effort to measure the impact of individual agency activity. State agencies operated using 5.8% less electricity in FY 2009 than in FY 2008 as a result of the program. Savings in 2009 electricity consumption translated to an estimated savings of $10 million in general funds, which could be allocated to other important programs. The Lead by Example Program relies upon two important components for success: the partnerships forged within state departments and between the public and private sectors; and the support offered to agencies in the form of technical assistance and training. Agencies openly share experiences, recommendations, and documents produced in the process of implementing efficiency measures. Quarterly working group meetings facilitate this exchange. The program’s emphasis on partnerships creates an atmosphere of collaboration, rather than competition, which the Department of Business, Economic Development & Tourism (DBEDT) believes will be critical to continued long-term success. The agencies receive support in the form of training, education on the value of the LBE program, and technical assistance. DBEDT provides much of the technical assistance, but the program found it valuable to have agencies take the lead on each project. This support structure has been critical to enabling agencies to learn about opportunities and take steps to implement them. The state’s Department of Accounting and General Services (DAGS), which manages and services over 150 state buildings, has entered into an energy savings performance contract for ten downtown state office buildings, including the State Capitol. The DAGS performance contract project demonstrates how both partnerships and support have helped make LBE an effective program. When DBEDT introduced the concept of performance contracting statewide, it began by providing technical assistance and training staff at the DAGS in order to transfer primary program responsibilities to DAGS. This initial partnership served as the model for future inter-agency collaborations. DAGS and DBEDT now offer trainings to other agencies for performance contracting and supply model documents. Hawaii is now one of the top states in the nation for performance contracting investment per capita. DAGS expects these projects to save over 6.3 million kWh of electricity per year, reducing utility bills by 30%, which equals approximately $3.2 million per year in operational savings. DAGS is in the process of executing a Phase 2 performance contract, which will cover the remainder of its building portfolio.